What is a Change of Phase? The term 'phase' in chemistry basically refers to a form or a state in which matter can exist. 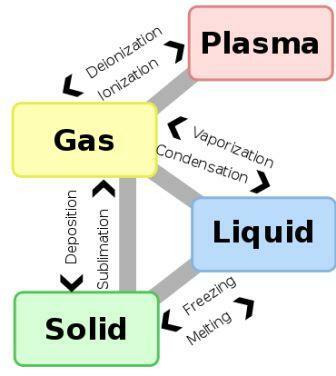 States of Matter such as solid, gas, liquid and plasma are examples of the phase of each substance. (Plasma is a state of matter similar to gas in which a certain portion of the particles are ionized). Any of the forms, or states, such as solid, liquid, plasma or gas, in which matter can exist, depending on temperature and pressure. When a substance, like water, changes from one state or phase of matter to another it is referred to as a change of state or that it has undergone a change of phase. For example, the melting of ice is a change of phase, or transition, of water from a solid phase to a liquid phase. The example illustrates a transition from one state to another, such as from solid to liquid or liquid to gas. This process can be referred to as a phase change, phase transition, physical change or state change. Each of the states of matter is also known as a phase. Elements and compounds can move from one phase, or state, to another phase when physical forces are present. A phase change is the process by which the physical states of elements, the states of matter, are altered. An example is a change of temperature. The phase or state of matter can change when the temperature changes. For example, when a solid melts and becomes a liquid, it goes through a phase change in which the state of matter, or substance, has been altered. Changes in temperature to water can change it from a liquid (water) to a solid (ice) to a gas (water vapour / steam). Phase Change Diagram - Melting, Freezing, Vaporization, Condensation etc. The following phase change diagram illustrates the phase changes that take place when there is a change of temperature or pressure. The above phase change diagram illustrates the phase changes that take place when there is a change of temperature or pressure. Change of Phase - Elements Map! For additional information about the elements featured on the Periodic Table adhering to the Change of Phase please refer to our comprehensive Elements Map!